Emerald Bay is a natural wonderland of wilderness beauty perched on the western shore of Lake Tahoe, California. The bay itself, like much of Lake Tahoe, is a striking emerald blue. Just floating on the water here is a pleasure. The surrounding wilderness of pines and cedar against the backdrop of soaring mountains confronts visitors with nature's majesty. Eagle Falls empties directly into the bay and is about as picturesque as it gets with powerful granite cliffs surrounded by evergreens. The heavily wooded Fannette Island floats in the middle of Emerald Bay with its granite core rising 150 feet above the lake. Set atop the highest point on the island are the ruins of the only man made structure: a Tea House erected by the island's owner Mrs. Lora Josephine Knight who was also the principal force behind the building of Vikingsholm. Vikingsholm was designed by the Swedish architect Lennart Palme who, with his wife, accompanied Mrs. Knight on an architectural "fact gathering" mission in 1928 throughout the Scandinavian countries accumulating ideas. The 38 room "castle" at the head of Emerald Bay is the result. Widowed and divorced, Mrs. Knight spent her winters in Santa Barbara and her summers at Lake Tahoe where she had a staff of 15. Built in 1929, Vikingsholm was intended as a summer home and Mrs. Knight entertained guests regularly. Afternoon tea was generally served in the library or on the terrace, but, occasionally, in the Tea House on Fannette Island. 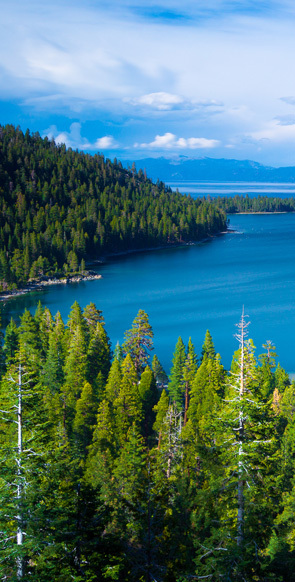 When visiting Emerald Bay State Park, touring Vikingsholm is a "must." Before the turn of the 20th century (prior to 1900), many boats and barges were sunk in the bay. As a result, in 1993, Emerald Bay was designated an underwater state park. No, it isn't the beautiful underwater flora that's being preserved; it's a bunch of sunken boats. Nevertheless, visitors will find the history fascinating. Emerald Bay State Park and D.L. Bliss State Park are side-by-side on the western shore of Lake Tahoe. A half-mile walking trail in D.L. Bliss State Park will bring curious visitors to 130 tons of granite rock teetering on a very small base. The Balancing Rock has been a popular tourist attraction for more than a century. Hiking, biking, fishing, camping, swimming, guided tours, and some exhibits are all available activities.